White spot lesions are defined as enamel surface and sub surface demineralisation, although these lesions can be reversed and do not form cavities. Infiltration using fluid resin proved to be a valid micro-invasive alternative compared with traditional conservative therapy. This has allowed treatment without any trauma (no use of local anaesthesia and cavity preparation) of numerous lesions in only one session with stable clinical (mechanical stability, enamel hardness, conservation of sound tissue) and aesthetic results (disappearance of lesions) over the time. The present report evaluates the effectiveness of Icon infiltration resin on postorthodontic white spots at 6 months, 1 and 4 years. Infiltrating resinous polymers are considered as an ‘ultra conservative’ or ‘non-invasive’ approach. The aim of this study was to assess the efficacy of treatment of WSLs with infiltrating resin (Icon, DMG, Hamburg, Germany) and to show clinical and aesthetic results in a patient affected by numerous WSLs, appearing after orthodontic treatment with follow-up at 6 months, 1 and 4 years. A 13-year-old boy, orthodontically treated, with fixed appliances for two and a half years, reported at the Department of Pediatric Dentistry, Clinic of Dentistry, University of Bari. On oral examination, the patient showed several ICDAS 2–3 WSLs on the following teeth: 1.1, 1.2, 1.3, 1.4, 1.5, 2.1, 2.2, 2.3, 2.4, 2.5, 3.1, 3.2, 3.3, 3.5, 4.2, 4.3, 4.4 and 4.5. Considering the high number of lesions, a mini invasive therapeutic approach with infiltrating resin Icon (DMG, Hamburg, Germany) was preferred, applying DMG Icon caries infiltration vestibular resin, due to WSLs localisation. Icon resin consists of a kit containing three syringes: Icon-Etch, hydrochloric acid, pyrogenic silicon acid and surfactant based; Icon Dry, 99% ethanol based and Icon infiltrant, that is the infiltrating methacrylate-based resin. 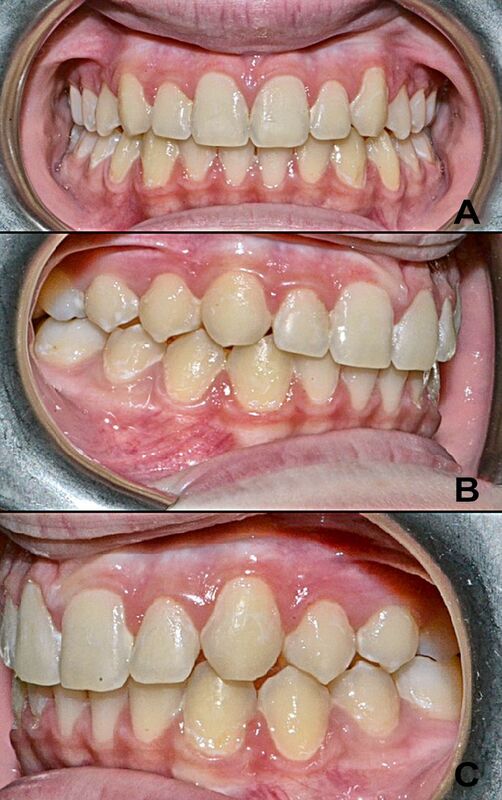 Before treating, teeth were cleaned with polish pastes (figure 1), rinsed again and the rubber dam was applied on them to protect soft tissue and achieve clean and dry working condition (figure 2). In the first step, after oral prophylaxis of teeth, the surface of the white spot was eroded by application of a 15% hydrochloric acid gel (Icon-Etch) for 2 min. The etching procedure serves to remove superficial discolourations and the higher mineralised surface layer, which might hamper resin penetration. Acid was sucked and rinsed again for 30 s; then the treated surfaces were dried. The lesion was desiccated by applying ethanol (Icon-Dry) for 30 s followed by air drying. Dry solution provides a preview of the aesthetic result that could be expected after infiltration. Previous studies on the subject showed that frequency of etching intervals needs to be adjusted to the surface hardness and the depth of the WSLs.7 In this case, on the basis of the aesthetic outcomes obtained, etching was performed a second time for a further 2 min on deeper lesions on teeth 1.2, 2.2, 2.3, 2.4, 3.2, 3.3, 4.3 and 4.4. Preoperative picture showing numerous white spot lesions (WSLs) of upper and lower dental arch. Application of rubber dam to protect soft tissue. The excess was removed using a cotton roll and, when necessary, using a dental floss. Then, Icon resin was light cured for 40 s with BA Optima 10 lamp. Finally, the rough surface was polished using disks and silicone polishers to avoid discolouration by food stains (figure 3A–C). The WLSs are not visible after the application of Icon. The patients reported no important adverse events or side effects during the 4-year period following infiltration. Standardised digital photographs were taken four times: before treatment, 6 months after (figure 4), 1 year after (figure 5) and 4 years after treatment (figure 6). Before taking pictures, the assigned teeth were cleaned using pumice and rubber polishing cups. Clinical examination and photographs showed relevant optical harmonisation of infiltrated WSL with adjacent enamel and aesthetic stability in the time. Colour and lightness characteristics of the Icon infiltrant as well as the aesthetic camouflage effects were not altered significantly or clinically relevant after 4 years. Besides, there was no progression of early carious lesions with arrest of lesions. 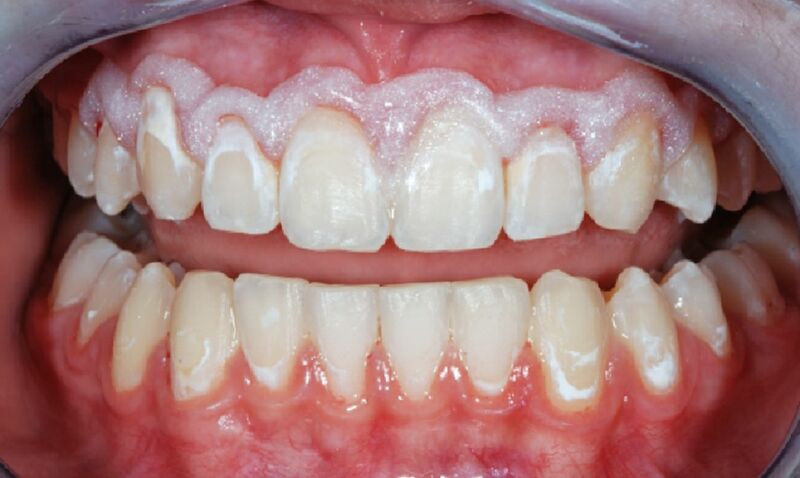 These non-carious white spots are usually limited to a few teeth (typically, anterior teeth) or generalised throughout dentition, covering the entire tooth surfaces, and are not associated with orthodontic brackets or bands. Several short-term studies, in vitro research and case reports have been conducted but case reports with a large number of involved teeth by WSLs and with a 4-year follow-up are not described. The results showed sufficient durability over 4 years and clinical and aesthetic results stable at 3 and 6 months, 1 and 4 years. The resin infiltration technique demonstrated having several advantages: mechanical stabilisation of demineralised enamel, maintenance of sound hard substance, permanent closure of surface micropores, obturation of porous and deeply demineralised areas, inhibition of lesion progression by increasing resistance to demineralisation and high patient compliance. Therefore, this treatment seems to fill the ‘treatment gap’ between non-invasive and invasive interventions for WSLs. The use of infiltrating resins prove to be an efficient microinvasive treatment for white spot lesions (WSLs), allowing to treat lesions in a single and non-traumatic session. The optical appearance of WSL was improved by lesion infiltration. The results achieved with Icon were stable over a period of 4 years in vivo. The patient reported no important adverse events or side effects during the 4-year period following infiltration.
. Masking of labial enamel white spot lesions by resin infiltration--a clinical report. Quintessence Int 2009;40:713–8.
. Prolidase deficiency: dento-facial aspects in a paediatric patient. Eur J Paediatr Dent 2014;15(2 Suppl):224–8. Contributors APC designed and performed the study. ARDF wrote the manuscript. ML analysed the data. VL supervised the project. © BMJ Publishing Group Limited 2018. Re-use permitted under CC BY-NC. No commercial re-use. See rights and permissions. Published by BMJ. This is an open access article distributed in accordance with the Creative Commons Attribution Non Commercial (CC BY-NC 4.0) license, which permits others to distribute, remix, adapt, build upon this work non-commercially, and license their derivative works on different terms, provided the original work is properly cited, appropriate credit is given, any changes made indicated, and the use is non-commercial. See: http://creativecommons.org/licenses/by-nc/4.0/.